BANDARERO, Kenya (AP) — Loko Kalicha Junno says she trekked for a week to save her 10 cattle from dying of thirst and hunger. But none survived. Now, at one of the last watering holes in this remote village, she fears for herself. “If this water gets finished I am going to die,” said the 64-year-old single mother of four. The scorched earth and scrubland in this semi-arid region of Kenya are littered with livestock carcasses in various stages of decomposition. Vultures wait patiently, waiting for nearby humans to leave. 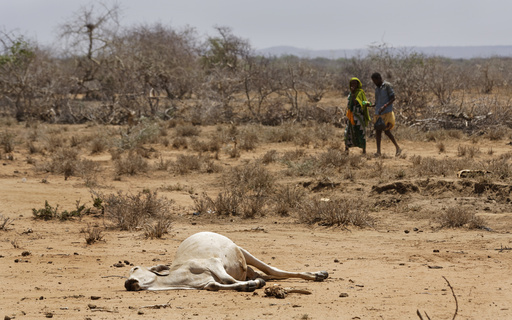 Kenya has declared the drought that affects nearly half of its counties a national disaster. To ensure the survival of her children, Junno has resorted to selling tea to other pastoralists, some even from neighboring Ethiopia, who like her have travelled long distances to remaining watering holes. The prices of livestock have plummeted as buyers take advantage of herders’ desperation. A cow that used to sell for $150 or more now sells for $20, and a goat that used to sell for $35 now goes for $2. Marsabit county is among 10 counties hit hardest by the drought in Kenya and beyond. Some areas have reported inter-community fighting and land invasions as pastoralists push further on their search for increasingly limited water. He pointed out that famine was declared last month in parts of neighboring South Sudan, and that another neighbor, Somalia, is at risk of famine for the second time in a decade. In Kenya, more than 2.7 million people are severely food insecure, O’Brien said. After a severe drought hit East Africa in 2011, Kenya and donors put in place measures to lessen the impact of future droughts on parts of northern Kenya that government reports have called vulnerable. Long marginalized, they have not received an equal share of national resources. The measures include a Hunger Safety Program that provides $24 for more than 100,000 households every month, as well as a school feeding program. But the measures are limited. Junno and other pastoralists said cash safety net services meant to cushion the vulnerable have not reached them. The UNICEF country director for Kenya, Werner Schultink, said an estimated 180,000 children had dropped out school at the beginning of the year in the 10 regions worst affected by the drought. The agency anticipates more than 100,000 children will need treatment for severe malnourishment by the end of the year. “I think that if there is continued shortage (of water) we are truly going to see a very bad impact on life and well-being of the population here in northern Kenya,” he said. Tags: #KenyaDrought, Africa, Kenya. Bookmark the permalink.